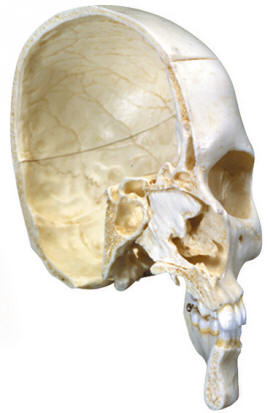 Made of bone-like material, this is a complete midsagitally sectioned skull. It can be disassembled into both halves of the skull cap and the base of skull, the nasal septum and the complete mandible. To demonstrate masticatory movement, the lower jaw is mounted flexibly. An excellent skull to study the body structure and the complicated anatomy of the human skull. The left bony half skull has been designed especially for the student's budget. The half skull can be disassembled into skullcap, base of skull, mandible and nasal septum. 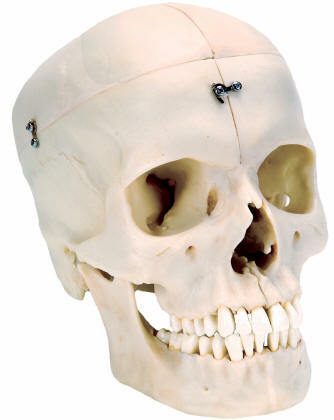 An affordable, first-class model to study all the anatomical features of the skull.